The game — though it's arguably more of an educational/informational tool than a game — may seem quaint today. The user is shown whimsically (but inaccurately) drawn maps of Walt Disney World and its theme parks, then clicks on attractions, resorts, or images representing topics like Imagineering or horticulture (yeah, really), and gets taken to a short slideshow of images playing under a descriptive narration and authentic parks music. Most attractions also feature "Backstage", "Trivia", and "More Stuff" sections containing even more information and photos. Today, trivia and photos of everything at WDW are available online from myriad resources; however, in the mid-1990s having a colorful, interactive tool with so much information (and music!) was extremely novel. Since mine isn't the first nostalgia-tinged writeup about The WDW Explorer, I won't go into a ton more detail. There are a few videos of it on YouTube for those who wish to get a feel for the game or revisit it. Instead I want to focus on a particular feature of the game, the interactive timeline. 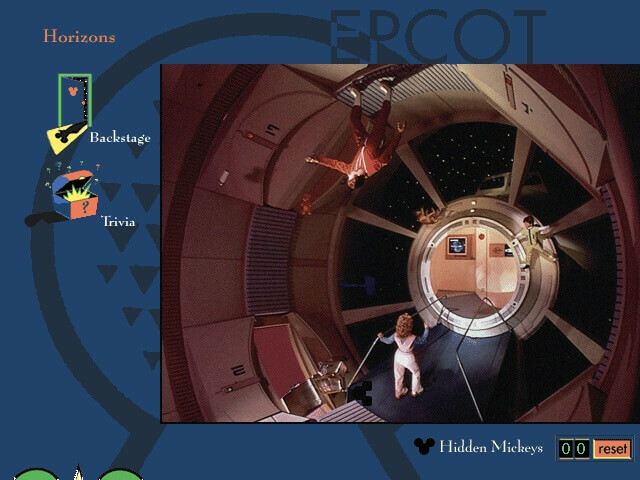 One of the memorable features of both editions of The WDW Explorer was the interactive timeline. For each year, from opening in 1971 to 1996 or 1998 depending on the edition, a narration explained some of the key developments at WDW. An overview map of the resort also updated with each year to show each new park or resort as it opened. One could slide the timeline back and forth and quickly watch the resort develop or regress. As a coding exercise, I decided to re-create the Second Edition's timeline in a web browser. The demo is below. Warning: After clicking start, roughly 10MB of data will be downloaded. (The game will begin before this download is complete). Sorry, your browser doesn't support <iframe%gt; elements. As you can (hopefully) see, the timeline is a fun way to explore WDW history. Most entertaining to me in 2018 is how it serves as a time capsule of when it was released. Notice, for example, the inordinate amount of space given on the map to the now-defunct Disney Institute. Seriously, it's as prominently featured as the theme parks (even moreso than Animal Kingdom). It should come as no surprise that the Institute opened in 1996. I imagine Michael Eisner (aka Captain Synergy), the driving force behind the Institute, specifically directed the art department to highlight it. Careful listeners may note that Disney-MGM Studios (now Disney's Hollywood Studios) is referred to as "The Disney Studios" in the game. As Yesterland points out, this "was due to a licensing limitation dealing with content distribution" that barred the use of the MGM name in certain contexts. This name was also used in promotional VHS tapes of the period. There are a few notable omissions (beyond the conspicuous lack of parking lots on the map). Coronado Springs Resort doesn't appear, nor is it mentioned in the narration, despite opening in 1997 and being featured elsewhere in the game. 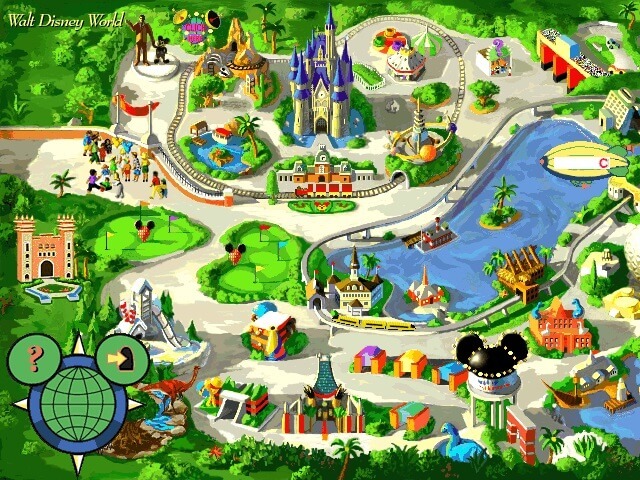 The opening of the Wide World of Sports complex is mentioned in 1997, but it does not appear on the map (probably due to lack of space). Take a moment to compare this map to actual satellite imagery of WDW. To put it lightly, there are some liberties taken to allow the whole property to fit on a 640x480 screen. Among the more egregious errors is the implication that Bay Lake and the lake bordering Downtown Disney3 (now Disney Springs) are connected by a short river or canal. In reality, they are not connected and are nearly four miles apart. Ironically, the navigable waterway in the Epcot Resort Area is not shown connecting to the Studios as it actually does. The placement of Port Orleans northeast of Bay Lake is also quite bizarre, as is the Speedway being east of Magic Kingdom. A few of the things present in the 1998 image that are now demolished or significantly changed: the WDW Speedway (demolished 2015), the Disney Institute (became the Saratoga Springs Resort in 2003), River Country (closed 2001; extant but abandoned), Discovery Island (closed 1999, also abandoned), Downtown Disney Marketplace/West Side/Pleasure Island (dramatically re-themed to Disney Springs, the name becoming official in 2015), and finally much of The Disney Studios: the Earful Tower was removed in 2016, the Studio Backlot Tour (represented by the tram) closed in 2014 and is the site of the upcoming Toy Story and Star Wars additions, and the Chinese Theater, though still present, no longer hosts The Great Movie Ride. For those wondering exactly how the web version was accomplished, the source is available on Github. The audio assets are taken straight from the game, though converted from the original '90s-era .WAV files that I couldn't get to play in an <audio> element. The image assets were trickier. There are no image files on the disc from which to easily snag them. Most of the visuals of the game seem to be in .SCN files that I heretofore have not been able to parse or decipher. It seems to be a proprietary format, and is likely compressed in some way. Thus, the images were created from screenshots of the actual game, which miraculously continues to run on Windows 7. The asset limitations prevent making the app anything but a fixed 640x480 pixels. The upside of this was the app wasn't a particularly difficult build, since positions could be hard-coded. The downside is support for touch devices is weak given the controls initially designed for the more precise mouse pointer. I made one slight improvement to the original game, which was to allow the left and right arrow keys to change the year. Otherwise, the experience is as close as possible to the original as I could get. AdamCOT is the personal blog of an aspiring front-end developer.